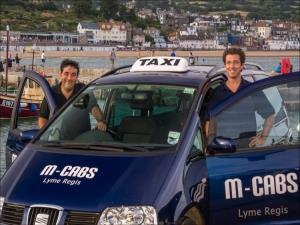 M-Cabs Taxi01297 442222work TaxiEighteen miles along the coast from Lyme Regis lies the village of Abbotsbury. This is the home of the world famous Swannery and is completely unique, hundreds of swans gather here but are free to come and go as they like. A lovely place full of beautiful birds. Very close by is the Abbotsbury tropical gardens, a stunning place described by Alan Titchmarsh as one of the finest gardens he as ever visited, it is famous for its fabulous collection of Camellias and Magnolias. Most of its 20 acres are accessible by wheelchair and there is a cafe. As lunchtime draws near we will take you along the coast to the very well known Hive Beach Cafe - one of the finest seafood cafes on the beach in Dorset. A treat lies in store. We will pick you up from your hotel or guesthouse at approx 9:30am travelling along the narrow roads to Abbotsbury with many coastal views, you will have approx 1hour with the swans. After that you will be delivered to the tropical gardens a short distance away. An hour or so later we are off to the Hive Beach Cafe for Lunch returning back to Lyme Regis for around 2:30pm. This times can be flexible if you wish. Eighteen miles along the coast from Lyme Regis lies the village of Abbotsbury. This is the home of the world famous Swannery and is completely unique, hundreds of swans gather here but are free to come and go as they like. A lovely place full of beautiful birds. Very close by is the Abbotsbury tropical gardens, a stunning place described by Alan Titchmarsh as one of the finest gardens he as ever visited, it is famous for its fabulous collection of Camellias and Magnolias. Most of its 20 acres are accessible by wheelchair and there is a cafe. As lunchtime draws near we will take you along the coast to the very well known Hive Beach Cafe - one of the finest seafood cafes on the beach in Dorset. A treat lies in store. £120 and we can carry up to 6 passengers. The admission prices for the Swannary and the Tropical Gardens will be extra.